Dental Arts Laboratories, Inc. is a family owned group of dental laboratories providing you with a complete range of services, including ceramics/crown & bridge, full and partial dentures, fixed and removable implant prosthetics, snoring/sleep apnea appliances and bruxism/occlusal splints. Over the last five years, we have made significant advancements in our digital platform of restorative services. We fabricate restorations using 3D computer aided design and German precision milling, providing unsurpassed quality and consistency. We encourage you to peruse our website to learn more about our complete line of products and services. As a thank you for choosing DAL, we invite you to join our Maui Jim Promotion. With every $3,500 of paid laboratory work with DAL, you can choose one pair of Maui Jim Sunglasses. Reward your staff or give them as gifts! Program is intended for new customers only. Dentist must be enrolled in the program to begin accrual and the sales will be calculated starting with the enrollment date. To enroll in the program, an enrollment form must be included with case or desire to be enrolled must be noted on prescription. To get started, simply call us at 1.800.227.4142 to request a DAL Starter Kit or click here to request one online! IPS e.max from DAL combines the high esthetic “Empress-like” esthetics with high performance strength for both anterior and posterior applications. Available for single crowns, 3-unit bridges (bicuspid forward), veneers and inlays/onlays. BioZX2 Translucent Zirconia from DAL is our new high performance translucent zirconia for full contour single crowns and bridgework. BioZX2 is made from the highest quality zirconia featuring increased translucency (due to its high light transmission) for improved esthetics and layered appearance, making it our most esthetic full contour solid zirconia crown. BruxZir Solid Zirconia is a full contoured zirconia restoration with no porcelain overlay. 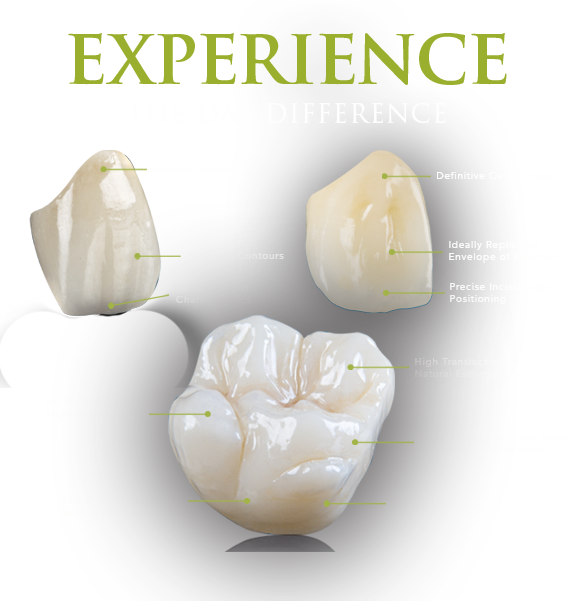 While BruxZir is more brawn than beauty, you’ll be impressed by its esthetics when prescribed instead of metal occlusal PFM’s and full-cast metal restorations. Milled on our imes-icore industrial quality mills, BruxZir is virtually unbreakable. DAL EZ (Noritake porcelain layered to BioZX2 Zirconia) is our recommended PFZ restoration that provides you with outstanding esthetics, predictable pricing and the ability to mill and layer bridgework up to 14 units. With DAL EZ there is no metal to show through the ceramic and no unsightly black lines at the gingival.